Oh Lord...this is a story. The six packs discarded as forgotten empties is a brilliant use of language, Pearl. Brava! I enjoyed where the words too you with this wordle. Beginning a family is a time so full of feelings and, yes, confusion. Oh, this strikes close to home...3 wks from grandfatherhood! Oh congratulations on the excitement we are not in a very different personal position! Enjoy the journey - and happy soon-to-be-grandfatherhood! :) A special thank you for stopping by and sharing!!! Really like that line "As something holy scurries". 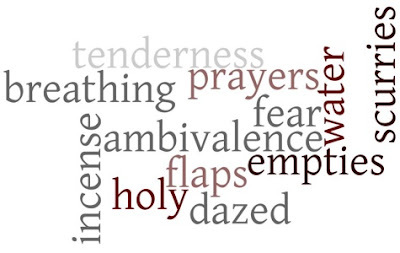 Seems to underscore a bit of what this particular list of words has affected. Just as the naming of a child underscores the sense of sacred responsibility that action should lend itself to. I am truly delighted that the poem that sprung from the words brought some pleasure to you. Thank you so very much for stopping by and commenting. Complex story here. Not only a poem but a saga. Rich work! Pearl, I love the water imagery. 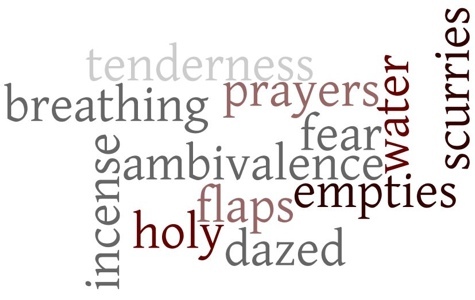 And "Dazed in incense" is such a wonderful image. Wow! Their infant "baptized into ambivalence". Powerful. Hope they make it! There are so many wonderful acceptance rituals, into faith yet to be projected, as yet they are the innocents protected. Wonderful wordle. A complex story tole well with wordling. I've been away too long. "As something holy scurries" something about this phrase Pearl...sad and beautiful poem my friend. Aw Laura thank you - too often too many find themselves in serious unresolved spiritual situations such as this one. I love this Pearl; it's so life-affirming and took me to such a nice place, I have to admit, it was something I was really thirsting for and your word choice and imagery are just wonderful ... so very fine. Thanks. Pearl, the final line and "something holy scurries" are brilliant. Catches one's breath the first it's read. Nicely done.